So I hear this is what happened the next day we lost to Milan 4-0. During the training session Arsene Wenger "went crazy" and was shouting and swearing at the players! 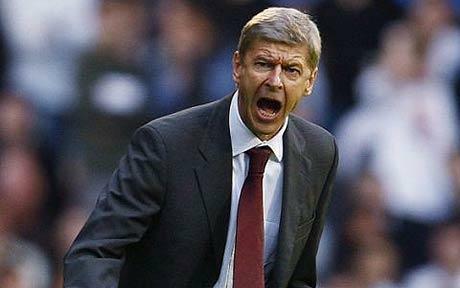 Some players said they never saw Wenger this angry before. It is now reported that Arsenal are set for a summer "clear out" as they will be looking to sell up to 7-8 players!! Including the likes of Theo Walcott, Arshavin, Rosicky, Denilson, Chamakh, Almunia, Bendtner, Vela, as well as Sebastien Squillaci. The players that are linked with moves to the Emirates are: Cologne’s Lukas Podolski, Borussia Dortmund’s Mario Götze and the Lille playmaker Eden Hazard but they add that Wenger "knows that Arsenal would have little hope of competing for such sought-after players if they fail to reach next season’s Champions League." Who cares?? wenger is a piece of crap he should quite his carreer.. It's normal that Wenger shouts.Most of his players are garbage.